Purpose: Offer an opportunity for our youngest disciples in the elementary levels to come together for fun and sing God’s praises. 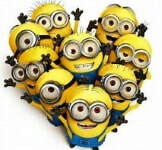 Occasionally the Minions will sing during the worship celebrations for the congregation to share in their love for Christ. Regular Meeting Place & Time: To be established with the involvement of parents and their availability.